Hello Friends, How is everyone doing? I Have no excuse other than I have been busy creating. What have I been creating, you ask? Well, Pocket Letters. Yup, I haven't created a card in weeks because I have been totally consumed by Pocket Letters. Ohhhh, they are so much fun. Basically, to me, they are like 9 ATC's in one shot. The themes I have created are Heidi Swapp, Shabby Chic, Vintage & Tim Holtz, Just to name a few so far.There is this awesome group called Pocket Letter Palsand that is the place to be now a days. Go on over and check it out and maybe you too can start creating these fun works of art. 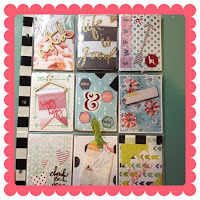 So, Those are my Pocket Letters and now that I am all caught up with those, It's time for me to hit a few of my favorite paper crafting blogs a do some challenges. So I want to Thank you for visiting me and I do hope you will come back again soon! !